Stir frying is considered a Chinese cooking method where ingredients are fried in a small amount of oil, on very high heat. Normally a wok is used as the cooking vessel although a cast iron pan works extremely well to conduct high heat. The Chinese technique has been around since the 14th century and was brought to the United States by Chinese immigrants. The appeal then is the same as now which is that it is quick. The western version of stir-frying is sauteing which also relies on quick cooking on high heat. And, in addition to being a reliable method of getting dinner on the table in a short amount of time, quick cooking is also thought to preserve more of the vitamins in the vegetables. Whether called stir frying or sauteing, the process is similar. The ingredients that take the longest to cook are added first. Then the quicker cooking ones are added and, finally, the flavoring and seasoning. It is important to cut the vegetables in similar sizes so they will cook evenly and in the same time frame. Cutting them into small pieces also helps the entire dish cook more quickly. 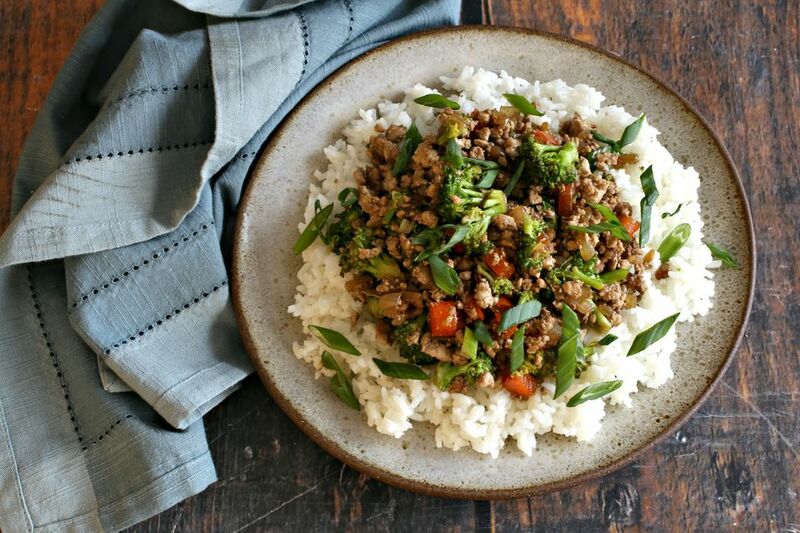 This recipe borrows from Chinese cooking in the use of soy sauce as the salt element but you can easily substitute salt and pepper if you do not like or cannot eat soy products. Try adding a tablespoon of Worcestershire sauce for a bit of extra flavor if you're eliminating the soy sauce. Add one tablespoon of the olive oil to a large skillet or cast iron pan. Do not use a non-stick skillet for this. Add the ground turkey and brown it for 5 to 7 minutes, breaking it up with a spatula or wooden spoon as you cook. When it is ready, move the cooked turkey to a plate and set aside while you saute the vegetables. Note that this dish works equally well with ground chicken. Add the remaining tablespoon of olive oil to the pan along with the diced onion. Saute on medium high heat, stirring often, for about one minute. Add the broccoli florets (these should be cut small) and the diced red bell pepper. Continue sauteing and stirring for another couple of minutes until the vegetables begin to soften. Add the finely minced garlic and continue sauteing for an additional minute. Then return the browned ground turkey to the pan. Add in the soy sauce and continue cooking and stirring for another couple of minutes, until the turkey has heated through and all the vegetables are combined. Serve over cooked white rice. Optional ingredients include julienned carrots and a splash of hot sauce or chili paste if you like your food spicy.